BAILEIGH Model BB-4812 Manual Box & Pan Brake 4' Length 12 Gauge Capacity. The BB-4812 box and pan brake from Baileigh Industrial is a staple in every type of metal fabrication shop. The small compact size makes it a great fit for tight floor plans, but the heavy duty construction makes it one of the most powerful manual finger breaks available. The fully welded framework, supported by solid steel adjustable trusses, allow the BB-4812 sheet metal brake to bend 12 gauge mild steel sheet metal over the entire 48” length. 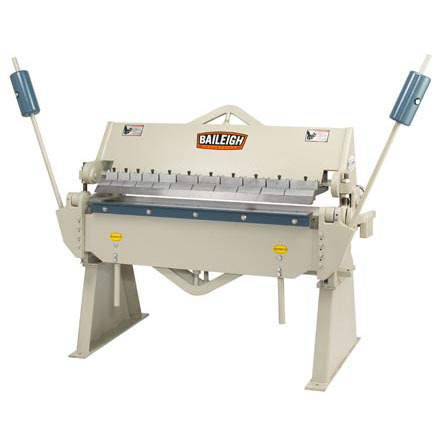 The BB-4812 weighs in at just less than 2000lbs, truly making it one heavy duty sheet metal brake. 3" – 4" – 5" – 6"
71" x 34" x 44"